Chiang Mai, once the capital of Lanna Kingdom back in 1588 and the city surrounded by valleys and mountains. Chiang Mai was beyond beautiful. Not the city only, but all the surrounding area was magical. After few days in Bangkok, we headed up north to visit this (touristy) Chiang Mai. Before leaving to Thailand, I already read so many blog posts and comments that Chiang Mai is popular by nomads and destination for tourists. Despite of all that, I still was determined to travel there, because the area has so much to offer! In addition, my goal was to experience lantern festival in Thailand and North of Thailand was the place to be. So here I was. Landed to Chiang Mai on the day of the first day of the festival. I have written my thoughts about the Lantern festival in my previous post already and now let me share with you things to see, do, eat and visit. 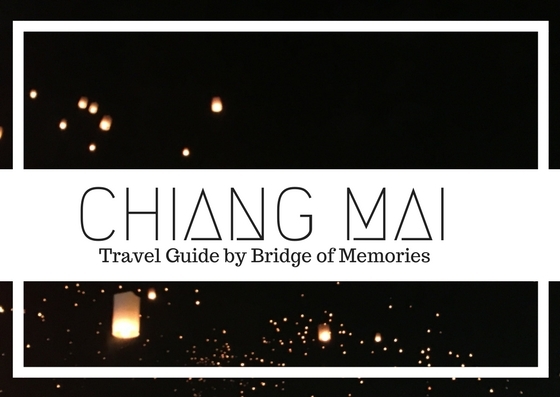 What to see in Chiang Mai? In order to protect the city back in Lanna Kingdom, the city is surrounded by a city wall around. The gates are on each side of the city and the wall. It is interesting that the structure remained until now and the only way to get in and out of the city is through those gates. Wat Chedu Luang is a Budhist temple located in the centre of Chiang Mai. The temple ground were originally made up of three temples - Wat Chedi Luang, Wat Ho Tham and Wat Sukmin. The construction of the temple dated back in the 14th century, where King Saen Muang Ma planned to bury the ashes of his father there. Phra Singh Temple is located on the west side of Chiang Mai city. It is one of the respectful temple in the city composed of many monastic buildings. If you are ever during the weekend in Chiang Mai, you should not miss their Sunday night market or so called Walking market. The market spans roughly for about 1km from Tha Phae Gate until Ratchadamnoen Road. It is a great experience to see the busy market night life in the center of Chiang Mai. Chiang Mai night safari is a nocturnal destination opened in 2016. It is the second night safari after Singapore. It was open to leverage the tourism in the city. Wiang Kum Kam is a historical and archaeological site located about 5km south from Chiang Mai. It was built by King Mangrai the Great as his capital before it was moved to Chiang Mai. However, the attempt to create a city was flooded and abandoned for more then 700 years ago. Chiang Dao caves are located north from Chiang Mai city and it is one of the main attractions in the Chiang Dao National Park. The whole caves complex have about 100 of caves which extend for some 10-12 km inside the mountain. Currently, there are five caves that are open for public. One of the great experiences and opportunities for you to do is to get involve in Chat with Monks programs that are in various locations around Chiang Mai. Great exposure to learn about their life, habits, views, believes and also for them to practice English. Even though you may get by using English, but learning some basic Thai phrases and words may be useful too. Ancient Siam is a large park constructed in the shape of Thailand, just outside of Bangkok. The idea of the park is to create an outdoor museum with Thailand's historically significant structures and miniatures. One of the recommendations to try out while in Thailand is to enroll to a cooking class. Trying our a new cuisine is just one thing, but trying to cook it yourself is another level. Thai dishes varies whether you are in south or north. The main dishes for Thailand would be Pad Thai, Green curry, Tom Yum, Masaman curry or Papaya salad. On the other hand, their main dessert highlight would be mango sticky rice. How to get around Chiang Mai? Chiang Mai city center is easy to walk around. It is great for spotting various temples on the way as well as to explore the city on the foot is always the best option in order to get out of the travelling the most. Many people do hire bicycles or motorbikes to travel around. If you are confident riding on it in a busy street, you may hire it on many places around Chiang Mai. Another option is to travel around Songtaew, which are these red van taxis. You either go to North gate, as they are stopping there a lot or catch one on the street. Always tell them where you going and ask and negotiate the price. They are good if you are travelling a bit longer distance outside of Chiang Mai city. Last option would be using tuk tuk, which are those three wheeled bikes with seatings at the back. Originated from rikshaw, but it just has an engine. It is a popular way to get around especially in Bangkok. However, you'll may find them in Chiang Mai too. Not as popular as songtaew, but worth to try it out as well if not travelling far. You'll read and hear about people telling you about scams and to avoid things. In my opinion, as long as you do your research, know roughly how it is worth it and you are willing to pay, be careful with what people are saying and taking you, then you are fine. At the end of the day, tourism is a big part of Thailand and people are trying to make money of it. Great place for your sweet tooth and hot weather. Picadilly is a great place to stop by for some ice cream and instagrammable desserts! If you are in the mood of something European. Great place for coffee and brunches! They have both indoor and outdoor seating and the food was lovely. Very big portion that fills you in for the half of the day. Expect foreigners to be in, as well as the price is a bit pricey compared to other places you can get food from in Chiang Mai. In Chiang Mai, you should try a dish with noodles and curry, called Khao soi. A Burmese-influenced dish served widely in north of Laos and Thailand is a noodle soup made with boiled and deep-fried egg noodles, coconut curry and served with chilli, lime, chicken or beef.This little cute restaurant have brilliant Khao soi. They have nice garden to sit outside which makes the environment very green and nice. The service was very friendly and food delicious! The best experience and for cheap food to eat around Asia overall is on street markets. You will find plenty of places where you can snack and try things. From full meal dishes to fruits and desserts. Just be aware of health! Not all food and cooking style may be appealing to everyone. Airport is very close to get to Chiang Mai. The easiest way is to get a cab from airport. They have a fixed rate fee and many taxis waiting on the airport. Another option can be taking a uber from or to the airport. During our stay in Chiang Mai we have stayed in B2 Green, located about 15 minutes walk to the city center and 10 minutes to a shopping mall and an area full of trendy food. The hotel was pretty convenient with many supermarkets, restaurants and bars around. The staff may be friendly, but not really helpful as they have spoken broken English and were not able to help us booking a taxi to get to airport on our departure day. As Chiang Mai is popular destination for bagbackers and nomads, there are many guest houses and hostels around the city. Other option could be an Airbnb. Sign up using my Airbnb link and get £13 of travel credits! Additionally, if you prefer hotels, book your stay through my Booking.com link to get travel credits too! Chiang Mai is a big area, especially located in the middle of mountains, hills and nature, you should not miss going outside of the city center. If you have more time after exploring the city, plan your excursions and road trips to some magical places around. Whether you are seeking adventure, culture, history or recreation, you'll find everything! It is important if you do some research prior and book things in advance if possible. We have travelled to Hmong village, Doi Suthep temple and viewpoint by songtaew from the North Gate and it cost us to get there and back with stops 200 Baht per person. Just go to Norh Gate where you will find many songtaew stopping around and ask! If you are larger group, then it will be cheaper to get there. For our experience with elephants (one of my highlight in Chiang Mai), we have booked our full day trip through Elephant Jungle Sanctuary. I will talk about it more in details in my next posts. However, overall, the experience was beyond great! They have took care of us well and planned our day really nice. Huay Tung Tao lake is a great for some recreational and peaceful day from a rush schedule. It is located not that far from Chiang Mai, easily reached by a bike or songtaew. Great place to have some time for swimming, lunch, picnic and just chill. "Chiang Mai is mountainous, picturesque and welcoming. The hotel in which my family and I stayed was managed or owned by a friend of one of the Thai Princesses. One day the Princess came to visit and the whole hotel was chaotically preparing and cleaning. Then the hotel guests gathered in the lobby to greet her upon arrival. It was a surreal experience." Truly legendary places remarkable sanctuary as like Wat Phra That Doi Suthep, I first visited in Chiang Mai with my girlfriend 3 years ago. the best scooter rental chiang mai https://catmotors.net/where-to-stay-in-chiang-mai/ sun, mouth-watering Thai food, and no worries, serenity, that's what awaits me on the long-awaited vacation.